Agrani Bank Limited (ABL) is established in 1972. It is a state owned bank. It is formed by the composition of ex-Habib Bank ltd and ex-Commerce Bank ltd. There are six section of ABL (Senpara branch) in GB- Cash, computer, account opening, clearing, Accounts and local remittance. The report indicates depth ratio analysis and financial performance of the year 2009, 2008, 2007 of Agrani Bank Limited. Here also calculate financial ratios like Liquidity, Asset Management, debt Management, Profitability, Market Value. Calculate these ratios for strong analysis and try to give a current and essential recommendation. Agrani Bank Limited (ABL) is established in 1972. It is a state owned bank. It is formed by the composition of ex-Habib Bank ltd and ex-Commerce Bank ltd. Agrani Bank Limited is a Bank with an Authorized Capital and Paid-up Capital of Tk.800.00 million and Tk.248.00 million respectively. The total equity of the bank stands at 725.00 million as of December, 2010. The total profit of last year is about Tk.680.00 million . There are about 867 branches in which 10 branches are corporate. There are about 341 town branches and 526 rural branches. The board of directors is consisted of 11 members. The Chairmen and Directors are nominated by government. There are six section of ABL (senpara branch) – Cash, computer, account opening, clearing, Accounts and local remittance. Cash section receive cash and pay payment in cash, computer section posting the vouchers, account penning section open new accounts, clearing section deal with clearing function, account section prepare different statement. The strengths of ABL are, State owned bank, Wide image, and unlimited trustiness about ABL to rural people, High commitments for customers, Qualified and experiences personnel. The weaknesses of ABL are: Absence of service providing mentality, Absence of IT Applications. Somewhat manual based, Lack of motivation of workers, depends on Head Office. The opportunities of ABL are: High demand of credit, High demand of small Enterprise financing, high demand of remittance facility, High demand of investment by Deposits. It’s Vision is to become a leading bank of Bangladesh operating at international level of efficiency, quality and customer service. And it’s Mission is We operate ethically and fairly within the stringent framework set by our regulators. We will go fusing ideas and lessons from best practice to explore new avenues to stay stronger and more efficient and competitive. We will apply information and communication technology for the benefit of our customers and employees. To figure out the liquidity, solvency, profitability and asset utilization ratios. To make a comparative analysis on financial performance based on the historical information. To find out significant issues and put some relevant recommendations. This report is fully based on primary and secondary data information. Primary data are collected from directly the officials of Agrani Bank Ltd (ABL). The relevant secondary data collected from internet, website of ABL, Annual report, Official data book. ABL is an government organization so they do not provide accurate information for making this report. Because of time shortage many related area cannot be focused in depth. Website in different organization of Bangladesh contains poor information. Recent data information on different activities was unavailable. Bangladesh is a developing country so the banking system as a whole plays a vital role in the progress of economic development. Banking system plays a very important role in the economic life of the nation. Banking is now an essential part of our economic system. Modern trade and commerce would almost be impossible without the availability of suitable banking services. Money market:The primary money market is comprise of banks, FIs and primary dealers as intermediaries and savings & lending instruments, treasury bills as instruments. There are currently 15 primary dealers in Bangladesh.12 banks and 3 FIs. The only active secondary market is quickly call money market which is participated by the listed banks and FIs. The money market in Bangladesh is regulated by Bangladesh Bank, the Central Bank of Bangladesh. Capital market: The primary segment of capital market is operated through private and public offering of equity and bond instruments. The secondary segment of capital market is institutionalized by two stock exchanges is Dhaka Stock Exchange and Chittagong Stock Exchange. The instruments in these exchanges are equity securities, debentures, corporate bonds and treasury bonds. The capital market in Bangladesh is governed by Securities and Commission. Foreign Exchange Market: Towards liberalization of foreign exchange transactions, a number of measures were adopted since 1990s. Bangladeshi currency, the taka, was declared convertible on current account transactions. The exchange rate is being determined in the market on the basis of market demand and supply forces of the respective currencies. To avoid any unusual volatility in the exchange rate, Bangladesh Bank, the regulator of foreign exchange market remains alert over the developments in the foreign exchange market and intervenes by buying and selling foreign currencies whenever it deems necessary to maintain stability in the foreign exchange market. There are three types of financial markets of Bangladesh. As Bank is a financial institution so it is a part of money markets. Also Agrani Bank is a part of money market. 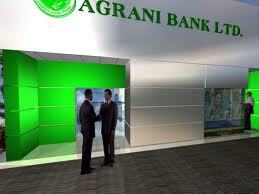 An overview of Agrani bank: Agrani Bank is a state-owned commercial bank of Bangladesh. It established in 1972. Its headquarter is situated at Motijheel in Dhaka. Agrani Bank was nationalized after liberation of Bangladesh. It started functioning as a commercial bank in 1972 and continued as a public sector bank till 16 May, 2007. On 17 May the bank started the third chapter of its life as a limited company. The bank now performs its commercial banking operation through 873 outlets all over Bangladesh under the leadership of a 13 member Board of Directors. In Bangladesh Sonali Bank is the largest among the Nationalized Commercial Banks (NCBs) while Pubali is leading in the private ones. Among the 12 foreign banks, Standard Chartered has become the largest in the country. Besides the scheduled banks, Samabai (Cooperative) Bank, Ansar-VDP Bank, Karmasansthan (Employment) Bank and Grameen bank are functioning in the financial sector. In Bangladesh the number of total branches of all scheduled banks is 6,038. Of the branches, 39.95 per cent, 2,412 banks are located in the urban areas and 60.05 per cent ,3,626 banks in the rural areas. Of the branches Nationalist Commercial Banks (NCBs ) hold 3,616, private commercial banks 1,214, foreign banks 31 and specialized banks 1177. Bangladesh Bank has been working as the central bank since the country’s independence. Its prime jobs include issuing of currency, maintaining foreign exchange reserve and providing transaction facilities of all public monetary matters. Bangladesh Bank regulates and supervises the activities of all banks. Bangladesh Bank is also responsible for planning the government’s monetary policy and implementing it thereby. In Bangladesh there are many commercial banks. They perfume very well. The growth pattern of some number of branches of commercial banks is very well. some are not well. Some growth of Employee of Commercial Banks is good but some are not good. Growth of branches: The growth pattern of number of branches of commercial banks. The growth of branches is highest in Dutch Bangla Bank Limited. The lower growth percentage is in Prime Bank. Till 2005 Prime Bank had 50 branches but in 2006 Prime Bank had closed 9 of its branches. Growth of Employee of Commercial Banks: The highest no of employees are working in Islami Bank Bangladesh Limited( IBBL) 7459 and lowest in DBBL. The growth percentage is higher in DBBL and lowest in Prime Bank. Growth of Deposit of Selected Private Commercial Banks: The growth pattern of deposits of commercial banks. It is observed from the deposit is highest in IBBL that is TK 132,419,403,524 in 2006. The growth percentage of Prime Bank is highest that is 51.92% in 2006. In 2006 Growth percentage of Dutch Bangla Bank and Dhaka Bank is 47.25% and 46.12%in year 2006 respectively. The lowest growth percentage of deposit is in National Bank Ltd. that is 22.33% in 2006. During 2002 to 2006 every year deposit of Dhaka Bank, DBBL, NBL, Prime Bank and IBBL has increased from the previous year except 2005. The commercial plays a vital role in the economic development of the country. The selected private commercial banks create employment opportunities for more than twelve thousand people. It has been observed that the net income of the commercial banks has increased. Liquidity ratios- A liquid asset is one that can be easily converted to cash without significant loss of its original value. The ratio is calculated by dividing current assets by current liabilities. Asset Management- A set of ratios that measure how effectively a firm is managing its assets. The ratio of sales to net fixed assets. Debt ratio =The ratio of total debt divided by total assets. Times interest earning ratio= Earnings before income tax divided by interest charges. Profitability – A group of ratios showing the effect of liquidity, asset management and debt management on operating results. Market Value-A set of ratio that relates the firm’s stock price to its earning and book value per share. Market/Book= Market price per share divided by Book value per share. Here current ratio is 0.11163 in 2009, 0.17023 in 2008, and 0.08942 in 2007.But the industry average is 4.1 x So it is the poor performance of Agrani Bank. Here fixed asset turnover ratio is 57.73 in 2009, 58.02 in 2008 and 54.68 in 2007. The industry average is 4.0x so it is the high performance of agrani bank. Here total asset turnover is 0.78 in 2009, 0.78 in 2008, and 0.72 in 2007.And the industry average is 2.1x so the performance of this sector is low. Here Debt Ratio is 1.87 in 2009, 1.97 in 2008, and 1.80 in 2007. Here debt ratio is decrease in 2009.And it under controlled. Because the industry average is 4.50 percent. In times interest earned they earned 4293.3 in 2009, 4220 in 2008. And 3506.6 in 2007.Their times interest earned increase every year. So here there performance is ok. (Amount in crore taka). In 2009 there profit margin was 3.57 percent, 4.31percent in 2008, and 3.86 percent in 2007.In three years their profit margin on deposits was higher in 2008 but the industry average is 4.7 percent so here their performance is low. Here Return on total asset was 3.04 percent in 2009, 3.37 percent in2008, 2.82 percent in2007. So in 2008 there performance is high. The industry average is 12.6%. The performance is ok. If their return on total asset is higher than 12.6% so there performance is low. Here a small different in 2009 and 2008. 2008 and 2007 was some ratio. Here the industry average is 2.0x. So in this section the performance of ABL was low. This ratio is smaller than the industry average. Fund Crisis: ABL have not enough fund. They have many deposits offers likes ABDS deposits, a special deposits is MIS. ABL gives the MIS deposits holders 10% interest in every month. As 10% of interest rate ,if any account holders deposit 10 lack taka than ABL will give him 10 thousand taka monthly. And they have many MIS holders. So they think that it is the main reason of crisis of fund, and they face shortage of fund. Biased decision regarding loans: In loan section they have not maintain the rules and regulation of Bangladesh Bank. General people face many problem to get loan but the officials get the loan eassily.Some officials do politics so their relatives get loan eassily.So it create many problem for fund. Violations of regulations: They do not follow the rules and regulations, some officers are absence in two or three days in a week. It creates bad effect to other employee. Poor management and job culture: ABL have a big problem like recently hey add online system but some branches have not this system. They have manual system, so many people cannot like this bank because in Bangladesh there are many private bank and they have online system. It is the poor management system of ABL. In IT section they have no IT manager so IT performance is very poor, many employee have no skill about IT section. So this is the reason that people cannot open account in ABL. In ratio analysis the bank indicates some poor and some good performance .So ABL should improve some sectors to overcome some poor situation. They should improve their fund and quality management to get ride for some poor performance situation. They should improve their fund by utilizing their money. Like they offer some scam and they give loan in high interest rate(house loans). They should change some rules of scam like MIS. They motivate people by their new scam. They should maintain and follow some rules and regulation of loans of Bangladesh Bank. They give the SME to the people for low interest rate for motivates people. They give any kind of loan and they take care the client who takes the loan. They should improve their quality management like IT system. They must train this people who have no knowledge about IT or online system; they change the manual system and give online system in all branches. They should recruit some people in IT sectors. They also avoid politics. They must follow the rules and regulations. So they overcome this situation.